Deep dynamic compaction (DDC) is a proven procedure that improves the bearing capacity of loose native soils, or uncontrolled fill. Large heavy drop weights are repeatedly raised by cranes and released to free fall, and the impact densifies the soil often greater than 20' deep. DDC is an economical alternative to cut/replace soils, or pile foundation supported structures. As the drop weights impact the soil, craters are formed which are subsequently filled and re-compacted until the desired level of densification, or soil bearing capacity is reached. Vibration monitoring is performed when working in the vicinity of adjacent structures or infrastructure. Pre and post-DDC test borings are normally performed to confirm the soils improvement has been successful. 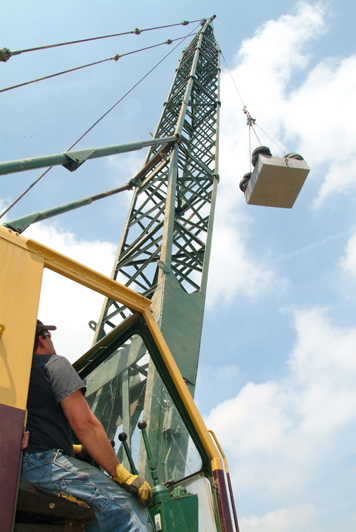 Earthcore has the rigs and support equipment required to provide DDC and to verify the bearing capacity as work progresses. Properly executed and confirmed, deep dynamic compaction will result in an improved site that can be built on with conventional spread footings.